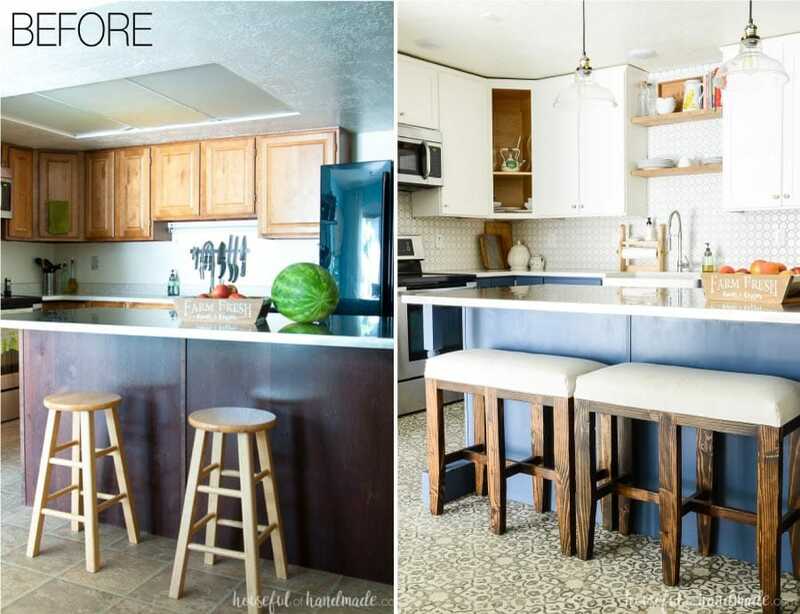 See how we created a beautiful two tone kitchen with loads of farmhouse charm. 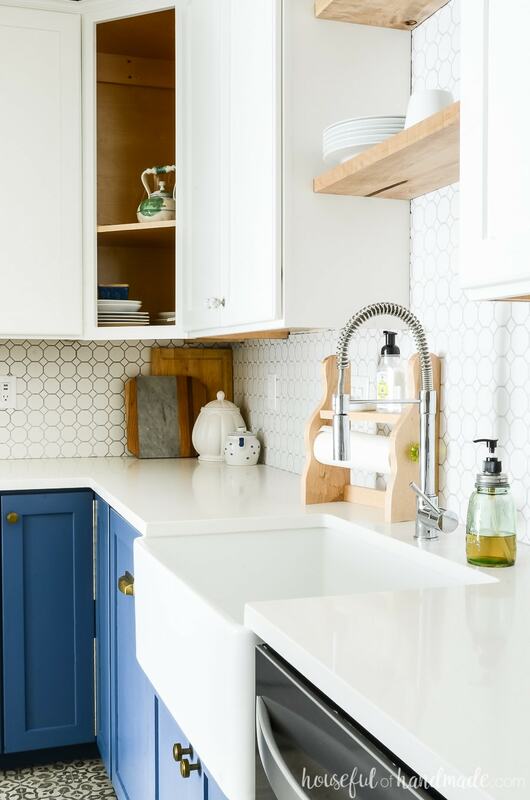 The blue and white two tone kitchen cabinets add instant style to the space. It’s finally done! I can officially cross this one off the list. 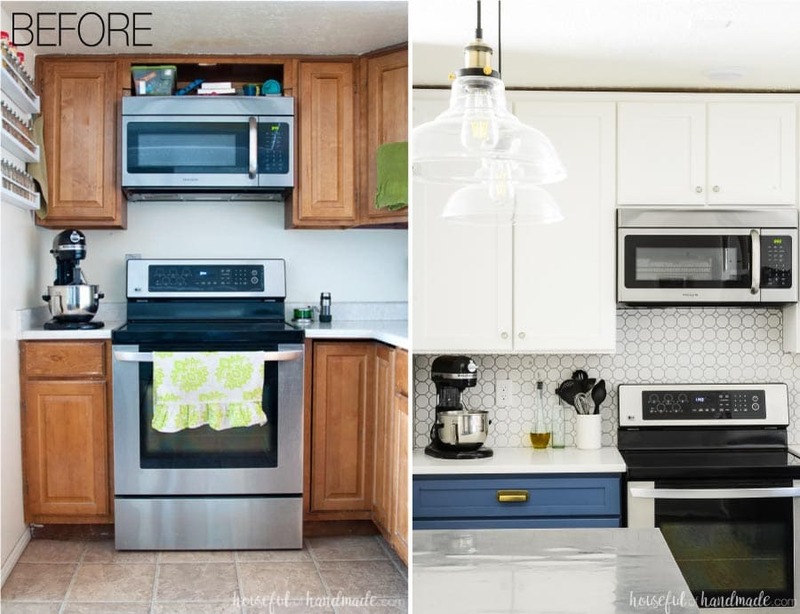 We will be the first to tell you that a DIY kitchen remodel is a lot of work. Probably twice the work you actually think it is when you get started. But it is 110% worth it. We are absolutely in love with our new blue & white two tone kitchen. If you have been following along, you will remember that we started this remodel in April (4 months ago). 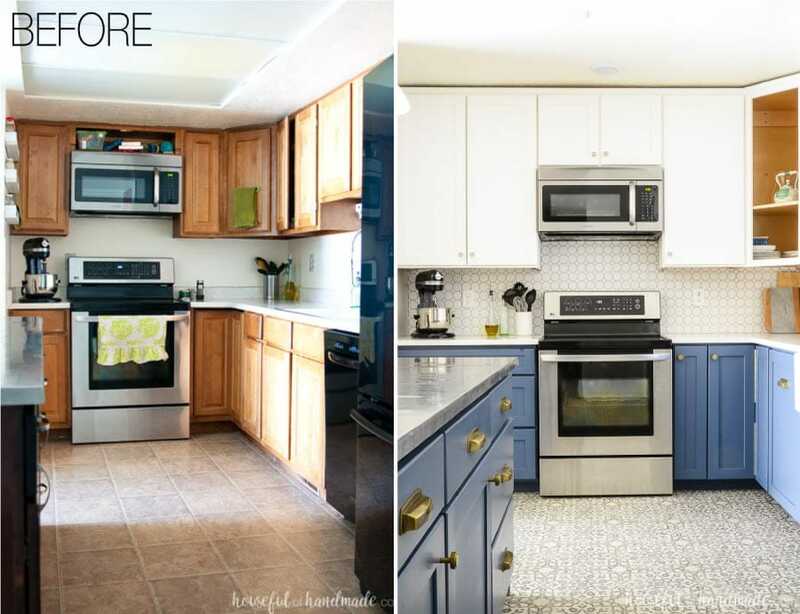 Our plan was to complete the two tone kitchen remodel in just 6 weeks. Are we crazy? Most would say yes… including my husband! And after 6 weeks we revealed a very beautiful almost finished kitchen reveal. The kitchen was mostly done and totally usable so we took a break. Instead of working sun-up to sun-down to complete all the final pieces in a week, we took our time. We did some other projects and even took a few vacations. But slowly we were chipping away at the kitchen. And now I am happy to share our complete two tone kitchen with you. Since it’s been so long, we need to remember where we started. We did not add any floor space to our kitchen. And our kitchen island was never moved. But our kitchen feels so much more open and larger! How did we do that? First was removing the ceiling soffit. Just over the kitchen in our open kitchen/dining room area there was a 14″ drop ceiling. I always wanted it removed so that the ceiling would be flush all the way across. That alone made the room feel instantly bigger. Next we removed 2 closets. I know, I know, removing storage space seems like a horrible idea in a kitchen. But we actually have the same storage space as before, but it is more accessible and organized. One of the closets was next to the stove area. It was so narrow and deep that things only went into this closet to be forgotten about. I used it to store the appliances that are not used regularly. By removing this closet we gained 24″ of counter space next to the stove. Now 2 people can cook at the same time and not feel like they are in each others way. Also, the two 36″ cabinets we gained, instead of the tiny 12″ ones that were there before, store so much and I can see it all. The other cabinet we removed was the pantry. Again, this pantry was so deep that things just got lost in the back so easy. The new cabinet pantry holds just as much stuff, but with pull out pantry shelves that make every single corner accessible. Also, by removing the large built in pantry we were able to gain another 24″ of cabinet and counter space between the sink and refrigerator. Now the space that was always cluttered with just a couple small appliances is a large prep space. After opening up the space to give us so much more usable room, it was time to design a beautiful and super functional kitchen! To make things beautiful I knew I wanted two tone kitchen cabinets. The contrast it gives to the space is instant style! And the darker lower cabinets will hide wear and tear easier than classic white. 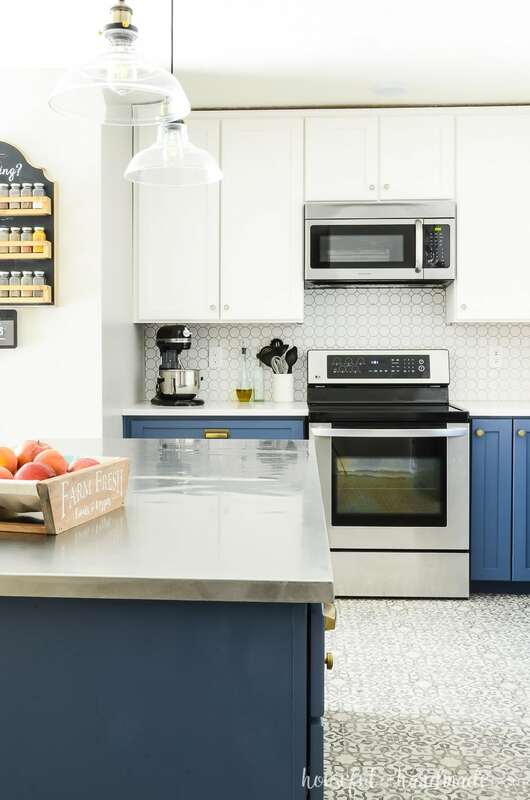 We partnered with Behr to find the perfect colors, thanks to them for supplying the paint for our two-toned kitchen. 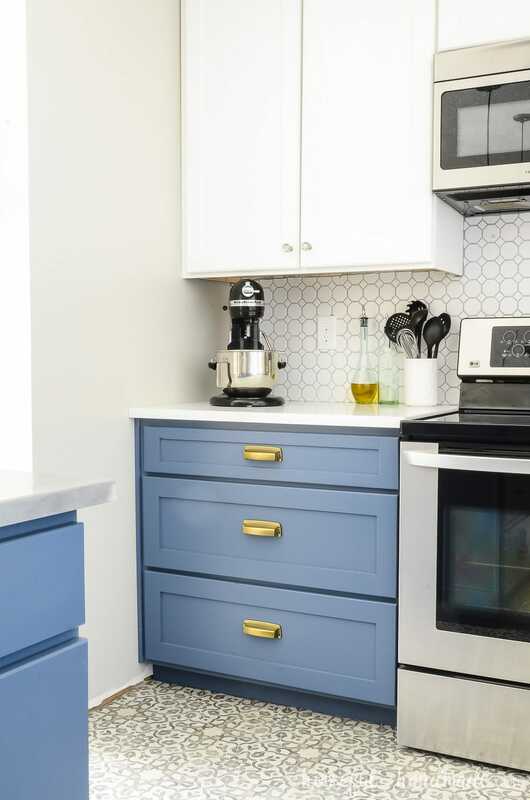 For the lower cabinets we went for a soft, dusty navy color from Behr called Durango Blue. We absolutely love the color and the navy color acts as a neutral to go with any decor we want to add. For the other half of our two tone cabinets, we chose white. The bright white cabinets reflect lots of light back into the space so our kitchen feels even bigger. And white will never go out of style. It is classic and clean and I love it. 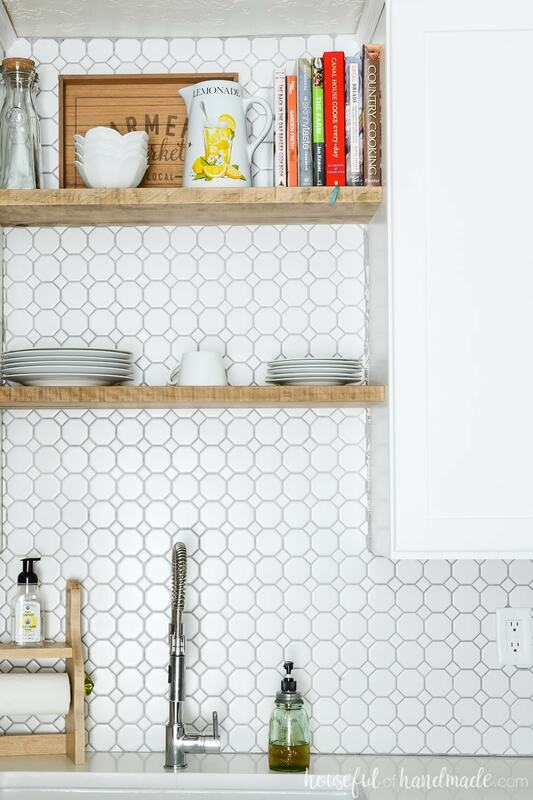 Our upper kitchen cabinets are painted Polar Bear by Behr and it might be my new favorite white. It’s just slightly warm from the Ultra Bright White but does not appear yellowish. To let the two tone kitchen cabinets be the star of the show, I decided to keep the backsplash and countertop neutral. 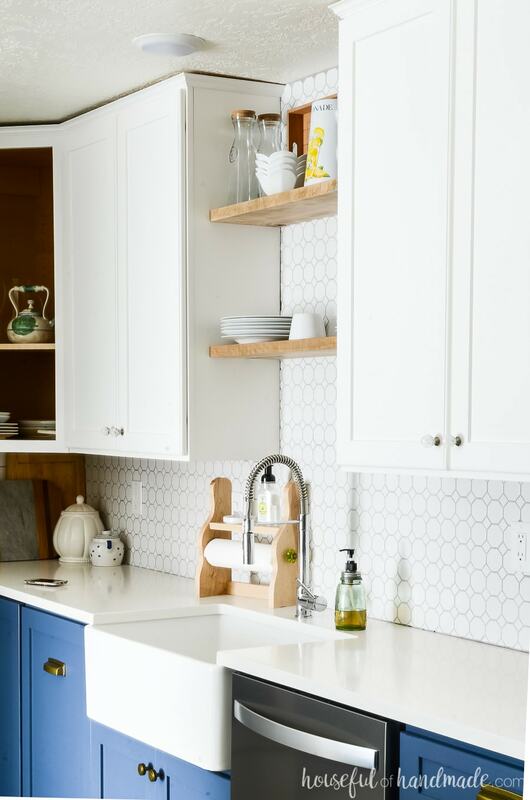 The white quartz countertops are amazing! They are super low maintenance and look great. I also chose easy and low maintenance for the backsplash. 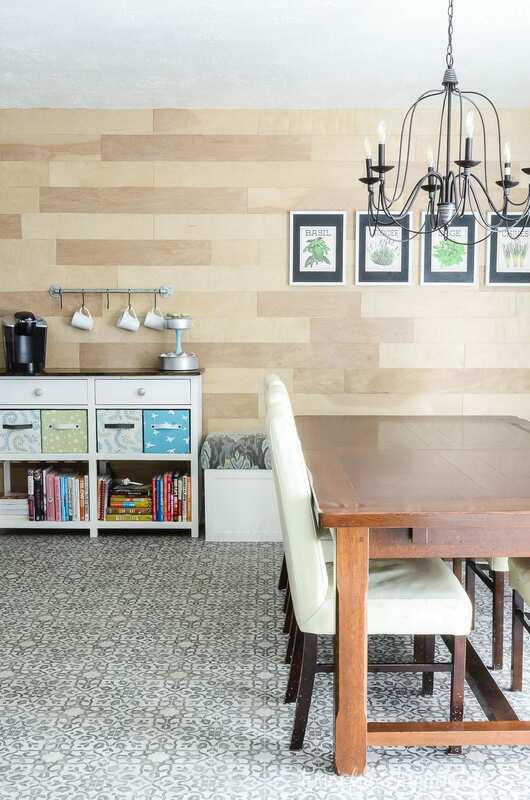 We partnered with Jeffrey court for the perfect budget friendly, low-mainntenece tiles. 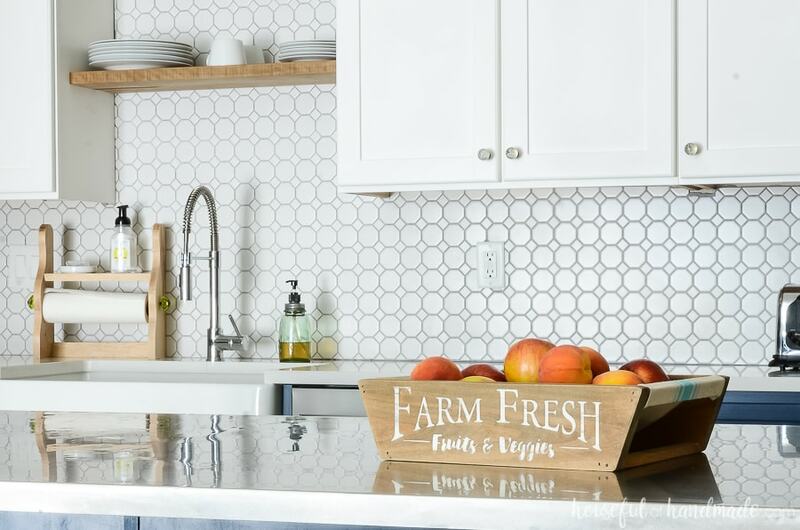 The Retro White Octagon tiles from Jeffry Court are porcelain tiles so they are tough. Porcelain is hard to scratch and resists stains. Perfect for a kitchen. Then to make it even more lot maintenance, I used a soft gray grout which will hide stains much better than white white making the pattern pop! To really increase the functionality of our kitchen, I knew I wanted the upper cabinets to go all the way to the new 8′ ceilings. 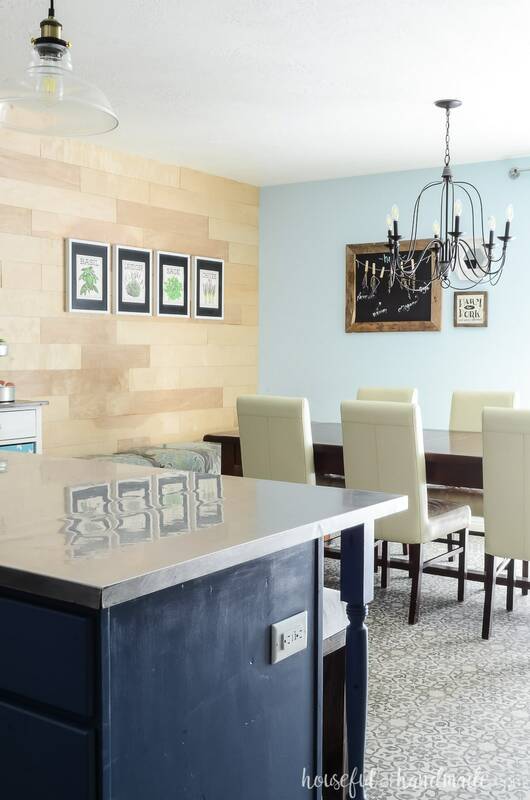 There is just something grand about 42″ upper kitchen cabinets. 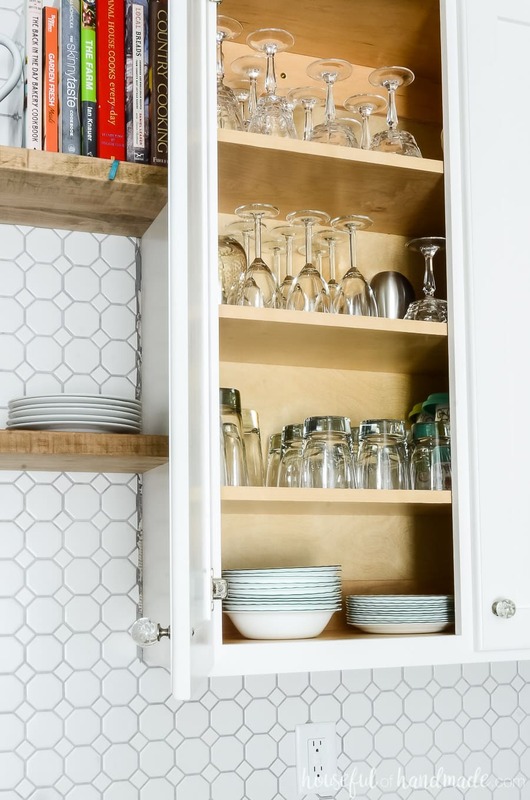 And even though I need a step stool to reach the top shelf, it is the perfect place to store less frequently used items (those items that once were hidden in the deep closet or pantry). I cannot believe how much more storage space we gained in the top of our cabinets. And for the lower cabinets, we chose to go with lots of drawers. Drawers make it so much easier to find things in lower cabinets. In the set of drawers next to the stove, I store cooking utensils, pots & pans, and all my cutting boards, sheet pans, and other baking tins. And thanks to the full-extension, soft-close Liberty Hardware drawer slides we used, I can easily access every single square inch of my drawers. And they close so beautifully (no worries about the kids slamming them). Then in the drawers between the dishwasher and the fridge, we store kids dishes. All their cups, plates, bowls and water bottles are now easily accessible. They can grab what they need without having to get the step stool, which means I spend less time putting the step stool away. And it is easier for them to help clean out the dishwasher too. Best decision ever! Also for the lower cabinets, we created a couple specialty cabinets. When you are designing a kitchen, I would recommend planing room in your budget for some specialty cabinets. They make life so much easier. 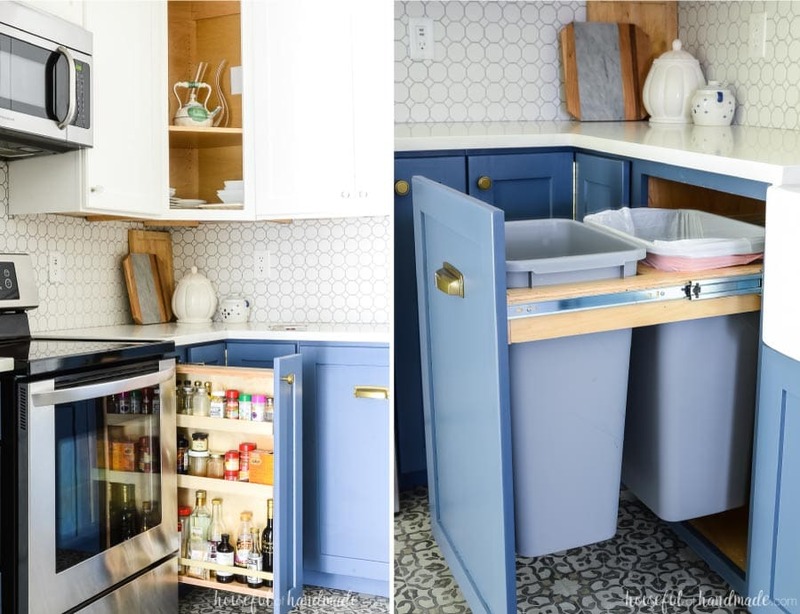 Typically these cabinets cost more, but the best part of building your own kitchen cabinets is that they are actually pretty inexpensive to build. Both our spice rack and pull out trash drawer were built from scraps. Yep, all those pieces that were going to be tossed are now two of my favorite parts of the kitchen! 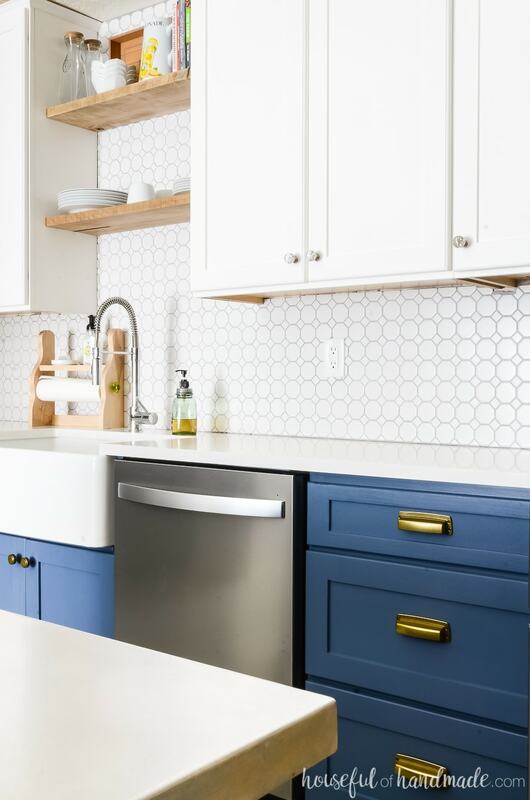 I could go on and on and on about our blue & white two tone kitchen remodel. I absolutely love this space! But instead I will let the pictures tell the story. And now I am going to go enjoy our new kitchen! As usual, you did a fantastic job! So happy for the beautiful new kitchen you now have so start creating those NEW MEMORIES in it!!!!! Thank you for sharing!!!!!! Enjoy!!!!!!! Thanks so much Dolores! I am already having fun creating memories in it. My daughter was helping me can fruits the other day. Just like when I was growing up! Those are the priceless memories and even better when you will be watching your kids teaching their kids! Life is so good! Have a special day!!!!!! Looks like a very well thought out working kitchen and beautiful to boot!! You did a fantastic job. It can now be your forever kitchen and aren’t you happy about that!! I am so happy it is done and will work for many years to come! Thanks Marybeth! The space is absolutely stunning!! You did an amazing job!! 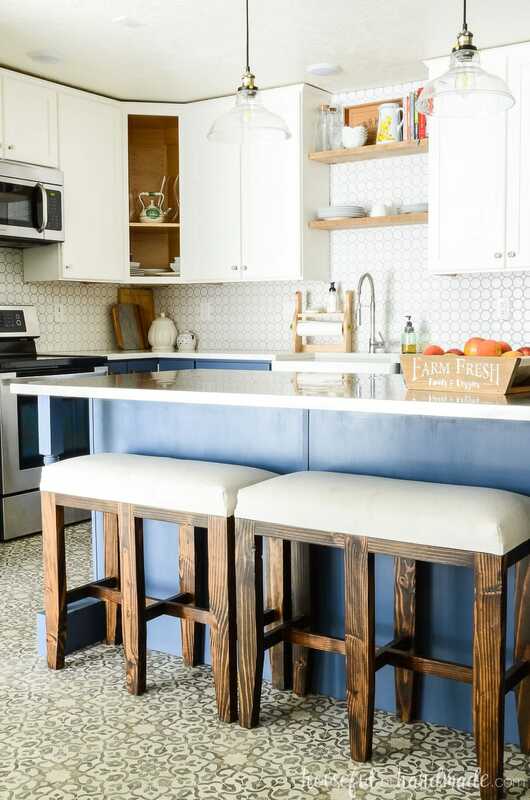 Ive always loved a blue farm style kitchen! Well done! Your kitchen is awesome. 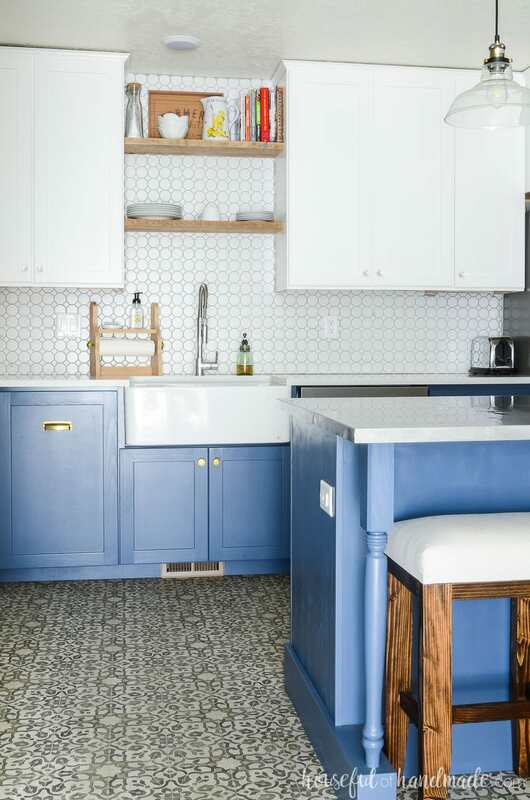 Love the floor tile and colour of the cabinets. Enjoy! Thanks so much Renette! I love the floor, but it is actually vinyl not tile. More comfortable when I am standing all day on it. The kitchen is gorgeous. Some of the colors are similar to my own. When we moved we remodeled and have all white wall cabinets but our island is blue. I love it! Thanks for sharing! I thought about doing the island blue and having all the cabinets white too. But then decided I wanted a bit more blue and hopefully it will hid my kids messiness 😉 Thanks so much Nicole! Looks beautiful and so functional!!! Great job!!!!! Thanks so much Teresa! I love how it turned out.